On Sunday, January 13th, Mrs. Maryam Rajavi, President-elect of the National Council of Resistance of Iran (NCRI), spoke at a ceremony in France celebrating the New Year, which was attended by a number of distinguished supporters of the MEK and the Iranian Resistance. Attendees at the event, which was entitled “Solidarity with the Iranian People’s Resistance and Uprising,” included former First Lady of Algeria Anissa Boumediene, former MP Dominique Lefebvre, Bishop Jacques Gaillot, the mayors of Val d’Oise, several Paris district mayors; and a variety of other notable French MEK supporters. In her speech, Mrs. Rajavi discussed the events of 2018 and then spoke about the current state of the Iranian Resistance and the Iranian regime as a new year begins. In summing up 2018, she said, “The most significant development in Iran was the outbreak of popular protests and uprisings against the mullahs’ regime. Rajavi also discussed the MEK Resistance Units that have worked together to organize the Resistance in Iran. 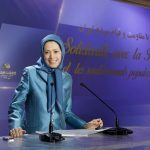 “Today, the Resistance Units supporting the PMOI are the flames of hope in the darkness of the mullahs’ religious fascism,” she said. Mrs. Rajavi went on: “They are particularly bewildered in the face of the upcoming uprisings. Just recently, the mullahs’ supreme leader warned that the enemies are planning for the next year. Mrs. Rajavi described the regime’s foiled terrorist plots against the MEK in Paris, Albania, the United States, and Denmark last year. She also discussed the mullahs’ latest demonization campaign against the Iranian Resistance. 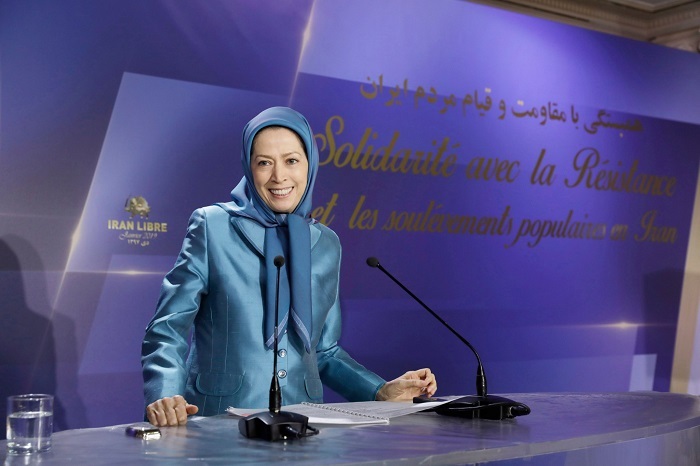 Mrs. Rajavi then called for the Iranian people’s right to freedom to be recognized, saying, “The time has come for France and the world community to recognize the right of the Iranian people’s Resistance to overthrow the theocratic regime and attain freedom.